Oscar Pistorius Will Be Released On Parole Next Week : The Two-Way The South African double-amputee sprinter nicknamed the "Blade Runner" was convicted of killing his girlfriend in their home in 2013. He will be under house arrest. South African athlete Oscar Pistorius (right) is escorted to a police vehicle following his sentencing at the High Court in Pretoria, South Africa, on Oct. 21, 2014. Double-amputee sprinter Oscar Pistorius will be released on parole on Tuesday, one year after his conviction for killing his girlfriend by shooting her through a bathroom door, South African officials say. He will be held temporarily under house arrest, and his parole will continue through 2019. As the Two-Way reported last year, Pistorius was convicted of culpable homicide — the equivalent of manslaughter — for shooting model and law student Reeva Steenkamp on Valentine's Day 2013. He was sentenced to five years in prison. An attorney for the Steenkamps, Tania Koen, told South African media that for the family, "nothing has changed in their lives." "Reeva is still not coming back. Whether Mr Pistorius remains incarcerated or whether he is released, Reeva isn't coming back so it doesn't make a difference to them," Koen said. 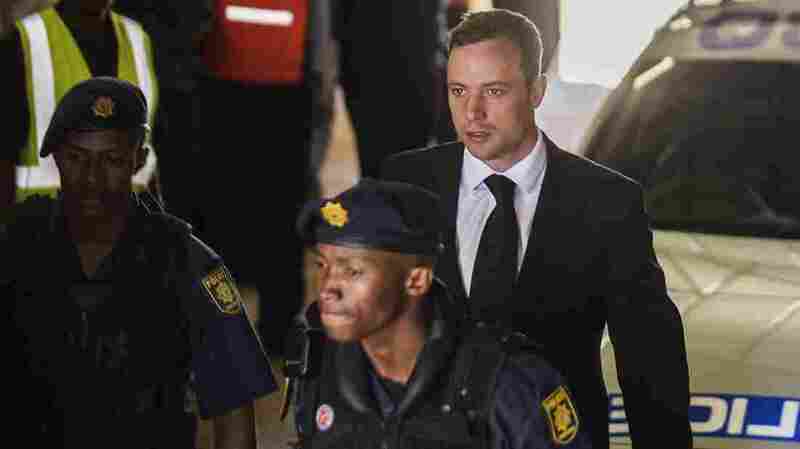 During his trial, which was followed all over the world, Pistorius said he fired his gun because he wrongly believed a burglar had broken into their Pretoria home. But prosecutors have maintained that he killed her after an argument and should have been convicted of murder. They are appealing the verdict, and if they succeed, Pistorius could go back to prison. Pistorius is a world-famous Olympian and Paralympian, known as the "Blade Runner" for his use of carbon-fiber blades during competition. His lower legs were amputated when he was a baby as a result of a genetic condition. Pistorius was originally scheduled to be released in August, but South Africa's Justice Minister Michael Masutha intervened, saying he hadn't served enough of his sentence. As part of his parole, Pistorius will be required to undergo continued psychotherapy and his use of firearms will be restricted, according to the Parole Review Board.